Of course you aren’t restricted to these setups with either speaker and despite being the older of the two, some will find the elongated Playbar preferable, while others will prefer the slimness and fresher design of the Playbase. The Sonos Playbar’s design is dated in terms of the rest of the Sonos portfolio but it is still an excellent option for improving your TV sound, while also playing a big part in a Sonos multi-room system. It has had numerous software updates over the years, as well as a price hike of £100, so with all that in mind, has does the Playbar work, should you bother, and what does it sound like? 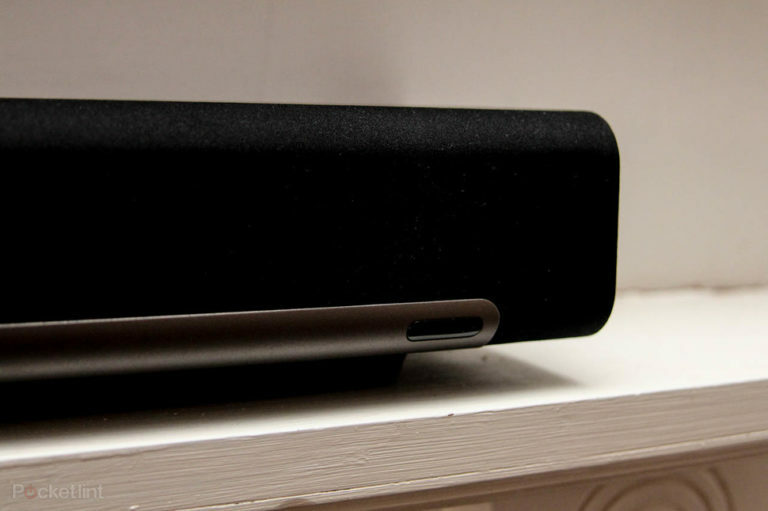 The Sonos Playbar is long, black and moody. That’s the immediate takeaway when you get the Sonos Playbar out of its box to set it up. It’s almost as wide as a 47-inch TV and it can be wall-mounted with specially-designed brackets, or just placed on top of furniture in front of your television. Some might prefer the Playbar’s design, while others will enjoy the smooth, clean lines of the newer speakers in the Sonos line-up. Given the Playbar has been around for almost five years now though, it is likely it will see an update to a fresher design soon, bringing in some of the latter design language used by the company. For now though, there is an IR receiver panel on the front and top of the Playbar, so it doesn’t matter how you mount the speaker, while volume control buttons and a mute button are present on the right-hand side of the Playbar. This means you can manually control the volume if you don’t have your phone, tablet, or TV remote to hand, but the buttons are also used for setting up the Playbar (more on that later). 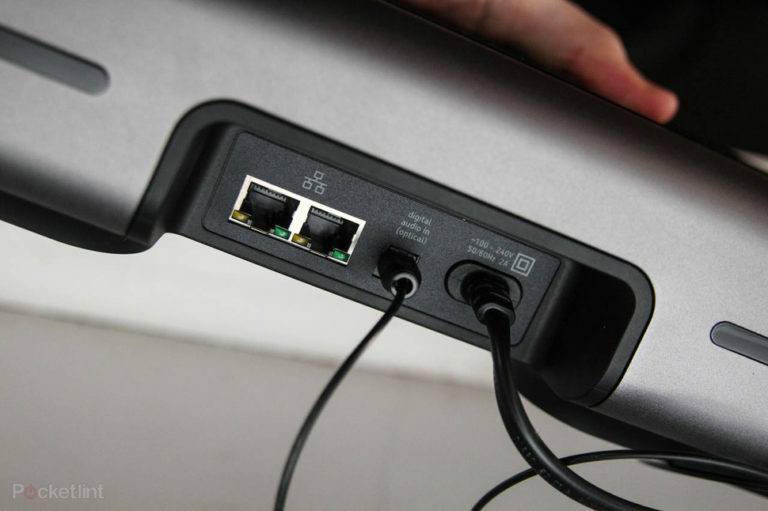 Hidden at the back of the Playbar is the power socket, double Ethernet ports and an optical audio input to connect the Playbar to your TV. Yes that’s right, no HDMI, something the Playbase also forgoes. There are also no analogue RCA inputs on the Playbar, something Sonos hardware included in the days before the Playbar and after in the old and new Play:5, both of which offer line-in via RCA. 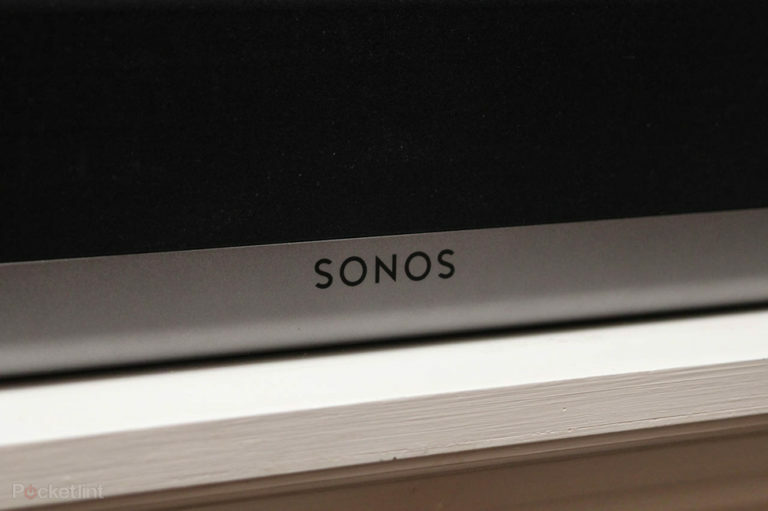 Sonos Playbar review: What’s the Playbar like as a TV speaker? If you listen to a lot of radio on your TV via an AV receiver and like to have the TV off when doing so for example, then bear in mind you won’t be able to do the same here unless you use TuneIn Radio or another radio streaming service through the Sonos app rather than your TV. The flip side to that is the Playbar detects when the TV is on however and performs the “handshake” automatically, ensuring you get TV audio rather than music audio and vice versa. That’s handy because it means you don’t get that frustrating moment of “why isn’t there any sound?” and in our experience, the Playbar performs the handshake perfectly every time. We’ve been using the Playbar for a number of years now and in that time, we’ve watched a range of content from EastEnders – we know, the horror – to numerous films from Avengers Assembled to the new Jungle Book and everything in between in order to get a good sense of its capabilities. The Playbar, in our experience, delivers an excellent sound across the board, creating a decent sound stage balancing treble and bass alike. It is slightly on the bass-heavy side, as most Sonos speakers are, but this is something you can adjust within the Sonos app. 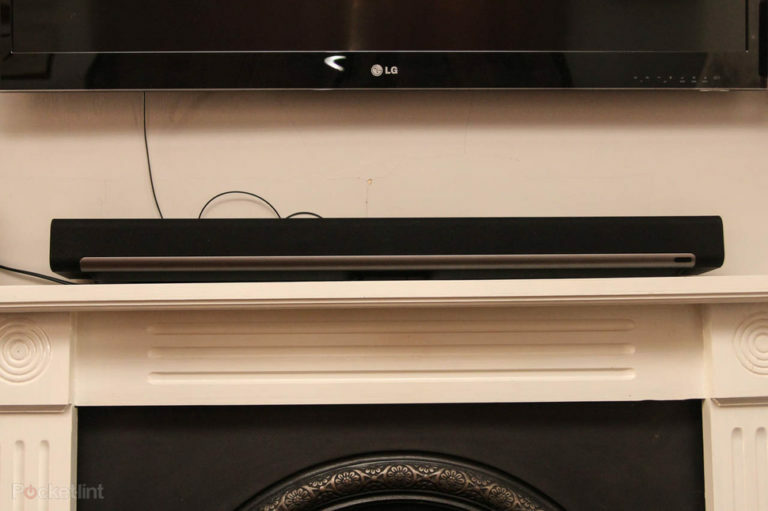 If we have any complaints about the Playbar as a TV speaker, it is that to get the most out of the nine speakers tucked inside you do have to turn the volume up, and that’s probably not going to make you very popular. Sonos Playbar review: What’s the Playbar like as a Sonos speaker? The Sonos Playbar isn’t just a TV speaker though. 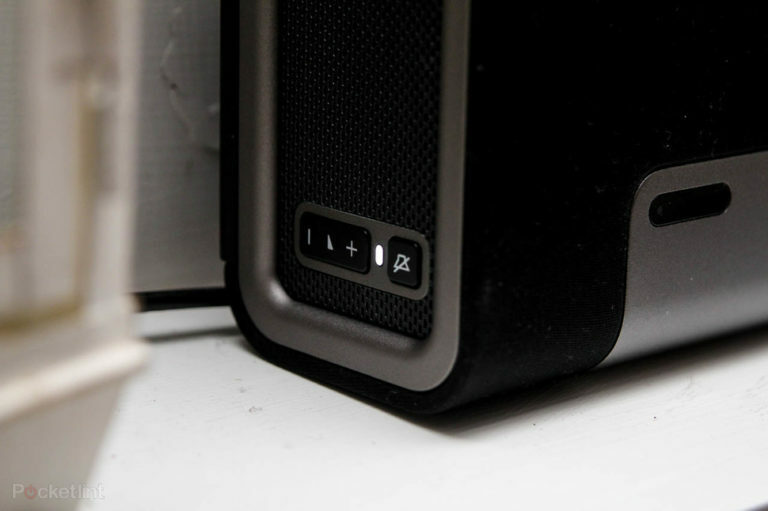 One of its key selling points, and Playbase for that matter, is that they are also a speakers that fit neatly into a current Sonos system (if you have one) or form the start of a Sonos system that you can come to expand. That means you can use the Playbar as a normal Sonos speaker as well as a TV speaker, streaming music from over 80 music streaming services such as Spotify, Apple Music, Deezer, as well as your own hard drive of music on the network, for a two-in-one solution. On top of all the standard Sonos features, it is possible to send TV audio from the Playbar to other speakers in your system, which is great for situations such as listening to commentary on a big game whilst cooking for example. To do this the Playbar has to be grouped into the same zone as the other Sonos speakers you want to hear the TV audio in, but it’s an excellent feature to have and one that comes in very handy. The sound of the Playbar is excellent and as a music speaker, it is fantastic, delivering a great sound experience regardless of whether you are listening to Norah Jones or the Prodigy. The only real comment we have is that the sound stage isn’t as wide as we would like. There is a noticeable difference when in front of the speaker from when you are standing beyond the directional cone. That’s understandable though, considering the Playbar is a speaker designed to be enjoyed in front of a TV and for the most part in most rooms you shouldn’t notice any difference – we do because we have a long living room. Sonos Playbar review: What’s the Playbar like as part of a home cinema setup? The Sonos Playbar is just one part of the puzzle though – the starter, if you will – to listening to your TV. Where it really starts to shine is its ability to connect to a Sonos Sub and two Sonos One, Play:1, Play:3 or Play:5 speakers in order to create a 5.1 Dolby Digital system. While it gets pricey, very quickly, the results are brilliant with the Sonos Sub adding heaps of boom to what the Playbar already achieves. Only the same Sonos speakers can be used to create a stereo pairing, so it won’t work with one Sonos One and one Play:3 for example, but the result of adding stereo speakers to the Playbar and Sub combination is worth it, even in the case of two Sonos One or Play:1 speakers. They might be small but the Sonos One and Play:1 speakers are mighty so depending on the size of your TV room, you might not need to splash an extra £500 on two Play:3 or £1000 on two Play:5 speakers. Adding a Sonos Sub or surround sound speakers is easy, and you can manage the equalisation via the app to. 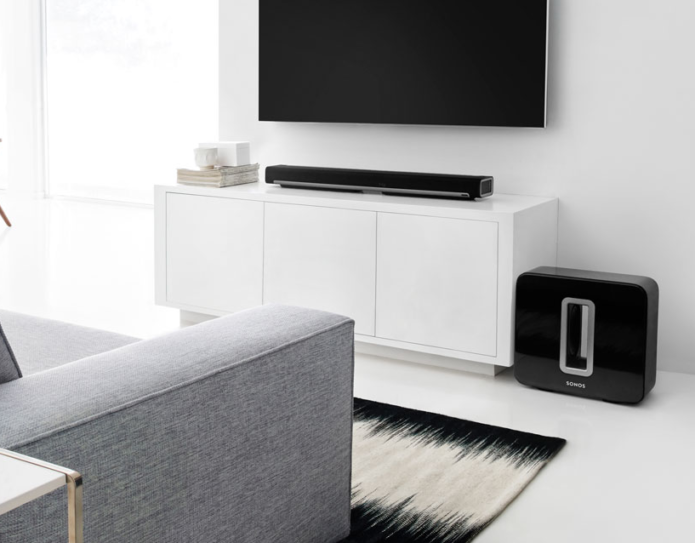 If you are looking to create a wireless home cinema system, the Sonos Playbar, Sub and Sonos speakers are certainly one of the easiest ways to do it. 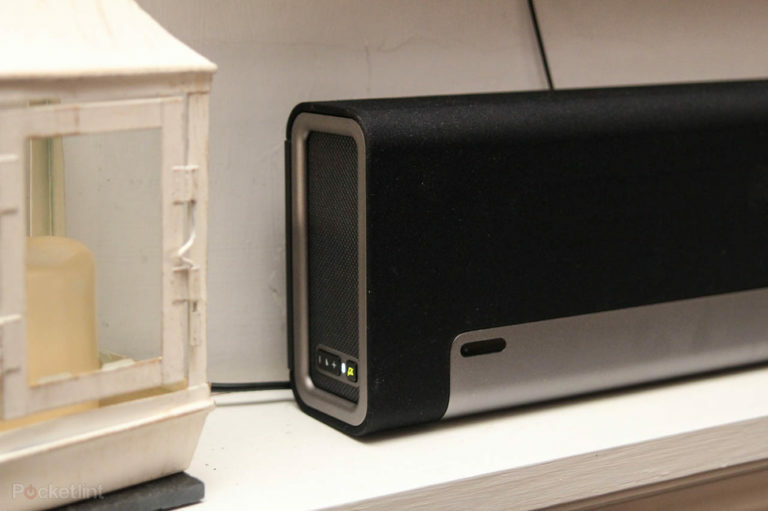 If you’ve got a medium to large-sized house this Sonos setup will work a treat. If you are going for a dedicated cinema room it probably won’t suit your needs, but then your budget might be a lot bigger too. The Sonos PlayBar setup is like any other speaker within the Sonos system in that you open the Sonos app (available on Android, iPhone, iPad or desktop), go into settings from the “More” section in the bottom right, tap on “Add a Player or SUB” then follow the instructions. These instructions boil down to ensuring the device is plugged in, waiting for a green or white flashing light, which will appear on the side of the Playbar next to the volume buttons, and then pressing the volume up and mute button simultaneously, as we briefly mentioned previously, in order to begin adding the Playbar to your new or existing Sonos system. You’ll need Wi-Fi but you no longer need a Sonos Bridge to connect your Playbar to your Wi-Fi network. There is a little more effort required to get the TV side of things working on the Playbar, although it’s all very straightforward and the process is easy enough with step-by-step guidance from the Sonos app. Ultimately in these steps, you’re setting up your TV to acknowledge that you are going to use an external speaker, which you’ll be able to do via the audio settings menu on your TV. Understanding that using your phone to control the volume on the speaker under your TV might not be that practical, Sonos also allows you to programme your TV remote, or any other learning controller, to adjust the volume on the Playbar, which is again something you are guided through on the Sonos app. It’s very simple though, requiring you to just press the volume buttons on the remote when instructed to by the app in order to teach the Playbar to recognise it rather than reprogramming the TV remote itself. The last stage of setup comes in the form of balancing the Playbar, followed by Trueplay, a technology Sonos introduced in 2015 that we briefly mentioned earlier, which allows you to tune a Sonos speaker to its surroundings using an iOS device (no Android yet sadly). Once again, you just need to follow the instructions within the Sonos app to begin Trueplay tuning and while you can skip the process altogether, we wouldn’t advise this as it’s very simple to do and well worth it. In a nutshell, the Trueplay software makes the Playbar (or respective Sonos speaker) emit a series of sounds while you walk around the room moving your iPhone or iPad up and down for 30 seconds, allowing the microphone in your smart device to determine the layout of your room and where your Playbar is positioned within the room in order to retune your speaker accordingly to deliver the best sound possible. Bear in mind that if you plan on adding a SUB or surround speakers to your Playbar setup, you’ll have to retune and you’ll also have to retune if you have a case on your iOS device too so take it off before you start. There are caveats of course. The Playbar expects you to have a TV capable of becoming your entertainment hub and therefore takes away the advantage an AV receiver offers with additional HDMI support. There is also the need to have the screen on and the positioning of a large black box under your TV rather than three discreet speakers dotted around, while some would also argue the lack of HDMI connectivity and 7.1 support isn’t very forward thinking, which it isn’t. The Playbar could do with a design update now but in terms of sound and performance, it’s still as great as it was when it launched all those years ago, if not better thanks to all the software updates.